Qualified to Teach: Baby, Toddler, Child and Foundation. Additional Aquatots responsibilities: Teacher Development Trainer and Teacher Examiner, Team Leader for te Regional Mentoring team, Regional Mentor and member of the Aquatots Development Team. A FEW WORDS FROM MARIA: As a competitive swimmer up until the age of 16 being in the water was always a passion, so naturally after having my first daughter Chloe swimming was definitely something I wanted her to do. Chloe joined her first Aquatots class at 12 weeks old and I was completely hooked after that first week! The classes were small and the pool beautiful and warm, the Teacher was so friendly and welcoming and the programme was excellent. It became the favourite time of the week as it was also so lovely to have some special family time and of course being first time parents that opportunity to make new friends some of whom we still see today! Becoming a Teacher was the best career decision I ever made, it's incredibly rewarding and loads of fun, I have had the privilege of seeing some of my babies from level 1 all the way through the programme to level 26 and and its just fantastic to see what the kids can achieve and the confidence and water safety they leave us with, I truly do have the best job in the world! Additional Aquatots Responsibilities: Regional Mentor: Mentoring a team of teachers to help with further development, as well as regular teacher pool assessments, sourcing new pools for region as well as their suitability, also advertising & marketing for specified region. Teacher Examiner: Assessing the ability of trainees in their pool examination Teacher Development Trainer: Responsible for the training and development of new trainees in a practical pool environment. Aquatots Development Team: Working with a team to bring ideas to further develop Aquatots training material, to keep it at the high standard of training we are known for. A few words from Angee: Working with Aquatots is not only fun, but very rewarding. To be a part of creating these special memories for your swimmers is fantastic. As well as being able to help make such an important skill to learn, be enjoyable and fun. My Favourite bits: Too many to choose from! I love every part of it; from the new level one babies having their first dip under water, toddlers achieving their 5 meters, child swimmers having fun snorkelling, to my aqua-natal mums bonding together. Additional Aquatots Responsibilities: Teacher Development Trainer – responsible for mentoring new trainees in a practical pool environment. Mentor of my own team of teachers – advising, supporting and checking the quality of the skills being taught and health and safety at the pools. A Member of the Aquatots Development Team. A few words from Gaynor: I originally began working for Aquatots as I was made redundant from my office job as a mortgage underwriter. I had doubts as to whether I would be any good as a swimming teacher, however, I really feel like I have found my ‘calling’. I absolutely love teaching the babies, toddlers and children, it is so much fun yet so rewarding when you see them grow in confidence and ability. My favourite bits: Getting to know the parents and their children is lovely, sometimes it really doesn’t feel like work. When we introduce ‘Diving for Rings’ the toddlers love it and don’t want to give the rings back again! The proudest moment is always watching the toddlers swim 5 metres on their own for the first time, the mums often cry (and so do I!). Additional Aquatots Responsibilities: Regional Mentor, Teacher Developement Trainer. Team Leader for Pool Co-ordination Team, Aquatots Developement Team. A few words from Rachel: I became an Aquatots Teacher as I have always loved swimming so it seemed like the perfect career change for me after having more children! Being part of the Aquatots team still continues to be a weekly reward and the training I have done over the years has given me confidence in the delivery of the whole Aquatots experience. As well as the reward of giving the children life saving skills, it is always such a pleasure to see the positive and unique moments that are delivered weekly to the parents and their children. Equally for me, the lessons with my children have been my most treasured time and I am continually marveled by what they achieve each level. My favourite bits: If I had to sum up my Aquatots experience I would use the words-positive, life saving, unique and special! I first experienced Aquatots as a parent swimming my son, Charlie now 10. I enjoyed it so much ( and of course so did he) that I wanted to pass this experience on to other familys so I decided to train up and join the team as a teacher. I now teach all swim levels + foundation and thoroughly enjoy it. It's the most rewarding job I've ever had and I can't imagine doing anything else now. There are too many to name! Every day I get to see and be a part of something special, from aquanatal classes with expecting mums, to babies 1st dip in lv 1 and toddlers first independant swims right up to the senior levels and the amazing distances the children achieve. I feel privileged to be able to see how the children develop and progress into fantastic, confidant young swimmers and to know I helped with that. Additional Aquatots Responsibilities: Teacher Development Trainer Responsible for mentoring new trainees in a practical pool environment. A few words from Alex:I started with Aquatots in the first place because i really wanted the picture of my baby under water, like the Nirvava CD!! Little did i know how much more i would get out of Aquatots, I now have an 12 year old that has swum 1750m at age 9, and a 8 year old that swam 300m aged 4, and 100m aged 3, unbelievable, I am the proudest mum ever, and just to think all it started with was a picture!. My Favourite bits:When they achieve their first 5 meters, being told that they really enjoyed their class. Teaching child levels and hearing the parents feedback on how much their child enjoyed their lesson, and the children telling me how much fun they had. I get a real buzz from that! A few words from yourself: I went to see my friends' baby swimming class last year and just thought the teacher looked like they were having such a great time! I love swimming and the water, and I love babies, so it seemed like the perfect career. I had a look online and loved the look of Aquatots, and here I am! My favourite bits: I absolutely love the volunteer swims, and helping parents swim their babies for the first time. For favourite bits: I enjoy watching everyone's progress but I really love seeing the foundation swimmers grow in confidence, especially for those who join us hating the water. After a lot of fun and confidence building, seeing them jump in and do their ready gos is really rewarding. A few words from Anna: I got the idea of becoming a swim teacher when I took my daughter for swimming lessons, so when I got the opportunity to teach at Aquatots I could not be happier. It is such a joy to see happy kids and their parents going through this amazing journey, learning such important skills, getting water confidence and having fun. My favourite bits: teaching important skills while having fun, seeing great progression in swimming, building confidence and being happy and proud of my little swimmer’s achievements. All these make this job very enjoyable, rewarding, exciting and perfect for me. A few words from Avril : As a child I was always found playing in the water or splashing around and have even been found swimming in the rain! I partook in competitive swimming galas when I was in my teens representing my school and church. My young daughters have been swimming with the programme for years. I enjoy seeing my girls' faces light up whenever I tell them we going swimming! I love doing what I do ,which is teaching children the gift of life which is swimming of course and having fun in the water. It is the singing! I love to sing! One of my favourite skills are playtime on the raft. I sing upbeat songs to engage both parents and babies to clap and make a splash. In future I would like to incorporate in all my classes to sing " baby shark" with a Ready splash skill! A few words from Heidi: My twins have been swimming with Aquatots since they were 12 weeks old (they are now half way through the toddler levels) and from that very first lesson, I knew I wanted to teach with Aquatots. I think that learning to be safe in water, learning to have confidence in water and learning to swim are those essential skills that all children should have. Aquatots teaches babies and children all of those whilst at the same time having lots of fun! I am passionate about my job and feel it’s a real honour to be able to teach so many babies, toddlers and children. My favourite bits: Seeing the journey that babies make from starting at just a few months old, working through the baby levels and into toddler - watching their confidence and ability grow and knowing that those toddlers have a solid foundation to go on to achieve their first 5m swims. 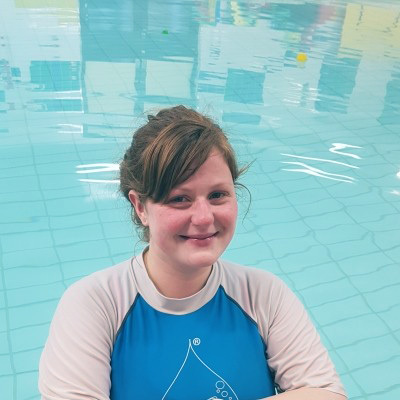 A few words from Hannah: I have always enjoyed swimming since I was small and loved the idea of taking my own daughter, so as soon as she was 10 weeks old we started lessons - she loves it! It is amazing how much they can do and how natural thewater can be for young babies. Aquatots is great because it guides parents on the best way to make the most of this, giving both babies and parents the confidence to enjoy the water and learn important safety skills while having fun and spending precious time together. My favourite bits: I love seeing the different personalities of each baby, how they interact with the water and progress and grow on their own journey as little Aquatots! A few words from Sasha: I have always loved swimming. It’s in my genes. I am a Pisces and the minute I am in water I feel at home. Aquatots came into my life at a time when I was losing the love of my career. I had done nothing else but the same job since finishing my education. And with having two crazy daughters I started thinking I needed something that allows me to have more time with them and enjoying life with them before they grow and disown me for not being cool anymore! My favourite bits: I love teaching. I love seeing the water confidence grow in the babies in my classes. And at heart I am a big kid and try to bring as much fun to the class for babies and parents. A few words from Fran: I'm a very active person sohaving the swimming pools as my office is perfect for me! I love putting a smile on babies faces and find my work very rewarding as I know I'm giving the babies water confidence and teaching them life-saving skills. My favourite bits: Seeing how much fun the little ones have in the water and how quickly they progress.. and fun time on the raft of course. A few words from Charlotte: My background is in revenues and benefits, but after my daughter started school, teaching with Aquatots was recommended to me by another teacher with them: I haven’t looked back since. As I loved to be in water myself as a baby, I am passionate about passing this love on to others from a young age. Teaching babies and toddlers on the Aquatots programme is very rewarding and I relish seeing how they develop skills and confidence during their sessions. I also know that it is something that will stay with them for life. Since my training began, I have continued to develop as a teacher, reflecting on my own skills and adapting these to make sure that all my pupils learn in their own way. My favourite bits: my favourite skills are Big Circle Little Circle, seeing babies faces so eager and excited to get to the middle, to the toy, really encouraging their paddling and kicking. Volunteer swims are also another one of my favourites, because baby or toddler overcomes fear or anxiety and suddenly ‘connects’ with me. This is when they really begin to respond. This is why I love my job! Qualified to Teach : Baby, Toddler and Foundation. Currently Teaching at: Bramley Hill and Whyteleafe. A few words from Cherie: I decided to become an Aquatots teacher whist swimming with my daughters in the programme. Seeing & experiencing the amazing skills you are able to teach your baby & toddler was so rewarding as a parent, I wanted to be involved in that experience with other families. Getting to know the families so well & being part of a wonderful journey. From the first day when you meet to seeing the children go on to achieve amazing things at such a young age. A few words from Dani:I absolutely loved doing baby swimming with all 3 of my children and after my third I was looking for a new career which fitted in around family life. I had worked for many years as a Watersports Instructor so I had plenty of experience working with children and water so swimming just felt like the perfect progression. I love working with parents and babies/toddlers and, having swum with my own, I know how much fun it is for both! My favourite bits:I love it all! It's lovely to meet the new babies in level one and to see their first swims but also to see how quickly they get used to it and what they can achieve by the later levels. I also love getting children in the later toddler levels to swim 5m completely on their own for the very first time in front of their very proud parents and teacher!! Additional Aquatots responsibilities: Teacher Development Trainer. Responsible for mentoring new trainees in practical pool environment. Marketing Co-Ordinator and ad hoc office assistance. A few words from Elise: I first encountered the Aquatots programme when I enrolled my baby daughter. We absolutely loved it, my daughter got so much positive stimulation out of it from the word go and I thought it was absolutely magical. I quickly started to look forward to our weekly sessions and treasured this lovely bonding time in pool, especially when I returned to work full time. I used to always think what a wonderful job the teachers had and I was quite envious. That is when it dawned on me to contact Aquatots and see if there were any opportunities for me. You realise how much your child gets out of the programme when you go on your family holidays and other people around the hotel pool can't believe how accomplished a young toddler is in the water, and comment to you how exceptional it is for such a young child to be able to do the things they can confidently do. It fills you with pride. My favourite bits: Helping nervous swimmers become accomplished swimmers and seeing babies grow into confident swimmers. I feel like a valued member of a team and I am given opportunities to progress and build new skills. I love my job! A few words from Gill: I became an Aquatots Teacher after having my son. I have loved the water since childhood and teaching people new skills, so I thought combining the two would be a great career move. I've not looked back since. I look forward to seeing my swimmers each week and get great satisfaction from seeing them all progress. My Favourite Bits: What I find most rewarding in my job is seeing the less confident swimmers overcome their fears to eventually love the water and it's always a huge thrill to see the toddlers bring all their skills together to swim across the pool unaided for the first time. A few words from Hannah: I have always worked in childcare looking after babies and young children ever since qualifying in 2002 as a Nursery Nurse, then years later as a Nanny which I still do during the week. I absolutely love the water! I like to spend time swimming, snorkling, scuba diving and kayaking whenever I get the chance. When my son was born, I desprately wanted him to get used to the water and enjoy swimming as much as I do. So when I found Aquatots, I couldn't wait to get him started! My son and I enjoyed every lesson so much, that I wondered what it would be like to teach. The more I thought about it the more I wanted to do it, so when the opportunity came about, I signed up straight away! I still get to work with babies which I love, whilst having fun and most importantly teaching them some of the most valuable life saving skills that they will ever need in the water. My Favourite bits: Seeing the tiny Level 1 babies growing with confidence, getting that little bit bigger and stronger every week and the smiles on their parents faces when they have learnt an exciting new skill, especially their baby's very first underwater swim! It's Priceless! A few words from Hayley: I have always been a keen swimmer and use to swim competitively when I was younger. After years of working in an office I decided I wanted a new challenge and to do something which I felt passionately about so what could more rewarding than teaching baby swimming! My daughter is in the Aquatots programme and even though I now teach my own classes, taking her to her lesson is still the highlight of my week. Favourite bits: seeing how confident both parent and baby become each week and knowing that as well as having fun we are teaching the babies something so valuable. I feel very privileged to be a part of all my Aquatots swimmers journey. A few words from Jackie: I have always enjoyed swimming and after 10 years in the airline industry I found myself teaching water safety to new cabin crew. When I had my son I knew I wanted to start swimming with him as soon as possible and at 10 weeks there we were in the pool! We went back week after week, we both absolutely loved our time in the pool and I was amazed at all the new skills we learned. When I saw a teacher recruitment advert there was no question I wanted to be part of the Aquatots team. My favourite bits: I love watching the small babies I meet becoming fantastic swimmers while having a lot of fun! A few words from Kayleigh: I have always loved swimming; as a child I was a member of my local swimming club and was even lucky enough to swim for my county. Unfortunately surgery on my ear meant that I was no longer able to swim competitively but I continued to swim for leisure. When my son was born prematurely one of the suggested activities to help develop his muscles was swimming, given my love for swimming I couldn’t wait to get started. From our first swimming lesson both my son and I loved our time in the water and it became the highlight of our week, when the opportunity to join Aquatots came about I jumped at the chance and haven’t looked back since! My Favourite bits: I love meeting all the new parents and babies in level one, many come to us nervous but excited and by the end of their first term it is lovely to see how much their babies have progressed and how much more confident the parents are! Of course it is also just as lovely to watch our swimmers progress through the levels and eventually swim independently. A few words from Kate: With a background in secondary school PE teaching, I was looking for a change from school life after having my two boys. Both swam as babies and seeing the value of enstilling lifesaving skills and water confidence in both my children, and also the students I taught at school, made me jump at the opportunity to train and work for Aquatots as a swimming teacher! It's a welcome change from teenagers too! I just love it! My favourite bits: There's so many! Witnessing and being part of developing a baby's confidence in the water is a gift, but most rewarding is seeing the confidence and commitment the parents show to keeping their children safe around water. Helping mums and dads who can't swim but that don't want that for their babies is such an amazing experience! It’s fantastic working with all 29 levels and being able to see a baby progress and grow into a toddler with boundless water confidence through to a child with accomplished technique! It is also so much fun! It doesn't feel like work to me! A few words from Kheyla:I have always had a genuine love for swimming and so when I had my son it was very important to me that he felt confident in water and loved it too. When he was 3 months old I started taking him to lessons with Aquatots and I absolutely adored having that time to bond with him in the water and seeing his confidence grow with each lesson. His teacher really made the lesson for me, her enthusiasm and genuine enjoyment from teaching our little ones was infectious. As I'd left my previous job to have my son it seemed like the perfect opportunity to try something new in such a rewarding field. My Favourite bits: There is nothing better than taking babies and helping them to find their love of the water. Those beaming smiles after completing underwater skills when they're so young or new to the water is such an incredible feeling as an instructor. Also, seeing how much the parents enjoy swimming with their babies, that transition from being a little more concerned and cautious to bouncing them around the pool and under water, as it's just as much about building the parents confidence in performing the skills as it is the babies. A Few words from Kimberley: I have always loved swimming, my mum was a swimming teacher too and took me swimming from a baby, as a child I also swam competitively so it’s something I’ve always done, I spent most of my childhood at the pool! When I had my own two children I wanted to get them swimming as soon as possible and really enjoyed taking them to the pool and seeing them gain confidence in the water. Having already trained as a swimming teacher I now really wanted to learn more about baby swimming, so when I saw an advert for Aquatots teacher training I jumped at the chance to sign up! My favourite bits: I love seeing parents and babies sharing that special bond together in the water and gaining confidence together. Most of all I love seeing everyone enjoying their lesson and having as much fun as me! A few words from Laura: As a child I always enjoyed swimming from an early age, and I knew the importance of water safety. So it has always been important for me to have my two children confident and safe in the water too. Both of them have had swimming lessons from an early age and continue to do so. I always had a thought in the back of my mind about becoming a teacher when swimming with my eldest child, but it wasn’t until going with my son that I made the decision to pursue it. I took the big jump to leave my previous job which gave me no time for family life, long and unsociable hours! And now I am doing the job of my dreams! It not only gives me my time back with my family but it’s the most rewarding and fulfilling job I can think of! Favourite Bits: Having a swimmer that is nervous and unsure and to work on that together with their parents and to see the confidence grow every week is the best feeling of self-worth! If you see the look on that little person’s face of their achievement then that makes your day complete. My partner says I do not work, I get paid to have fun in the water with other parents and their children – and he’s right! My Favourite bits: I love so many things about being an Aquatots teacher from helping parents to become confident in supporting and developing their children to seeing them achieve something new too. I particularly enjoy capturing their special moments underwater in photos and seeing the look of amazement on both parents and childrens faces when they see their prints for the first time. A few words from Laura: I first found out about Aquatots when my work colleagues kindly bought me an Aquatots swimming voucher for a Maternity gift for my first son. They knew how much I have always loved swimming and how keen I was for my children to love it and become confident swimmers too. From the firstlesson in Selsdon I was hooked and when my second son came along he became a Aquatots swimmer too. Over this time I enjoyed it so much and was amazed athow the parents and babies enjoyed it and progressed so much so much that I decided to become a teacher myself! My favourite bits: I absolutely love the first day of the level ones! I get to meet all the new parents and babies and seeing how excited they are and how much their little ones love being in the water is such a specialmoment. Seeing the progression and confidence through the weeks and levels is amazing too. Its s very proud moment when they receive their first officialcertificate and get to see their underwater photos. I also reallylove the fun I have in the toddler levels and seeing them achieve their 5m and the challenge that comes with getting Foundation swimmers to over come their worries and fears. A few words from Laura: After returning from maternity leave, I knew I wanted a different job to my previous office job. I swam with Aquatots with my son and we both loved the time we spent together. Seeing the progress he has made and how much he enjoys swimming, I knew I wanted to teach others to have the same experiences as us. My favourite bits: Seeing the baby’s progress week from week and how much they are learning. A few words from Louise: I have always been a keen swimmer since I was a child, so once my son was born I was eager to introduce him to swimming as soon as possible. This is when I discovered Aquatots and the fantastic swimming programme they have. I was staggered with the progression my son made just in level 1 alone. It was at this point that I knew I wanted to become an Aquatots teacher as I could see how rewarding and fun the job must be. As an Aquatots teacher I count myself extremely lucky to have a job I enjoy so much. The feeling you get when you see the confidence and ability grow in a young child from the initial level 1 when it is often the child’s first experience in a swimming pool, right through to level 7 is so satisfying and fulfilling. My favourite bits: The most challenging and yet rewarding part of my job is teaching the Foundation Levels. To see the class develop from being scared of the water, to being able join a regular Aquatots class, and learn to swim with confidence is amazing. My favourite bit is when a Toddler does their first 5m independent swim. I feel as proud as their parent does, because I’ve helped them to achieve it! Additional Aquatots Responsibilities: Teacher Development Trainer Responsible for mentoring new trainees in practical pool environment. A few words from Mark: I got into teaching for Aquatots after I broke my neck and retraining into the fitness industry. I would go along to watch my eldest daughter, Emma swim with my wife, I then took over her lessons and as they say ‘The rest is history’. I got bitten by the bug and been doing it ever since. I've heard swim teaching called a job but this is way too much fun to be called that. Both my daughters still swim with Aquatots, Emma who is now 6 and is doing level 26 again in Sunbury as she loves swimming so much. Alice who is coming up 4 is in level 17 and another little fish that can't wait to get in the pool each week and never wants to get out. My Favourite bits: To sum up Teaching for Aquatots is a real joy and a massive buzz, seeing these tiny babies come into the pool at 3 months old not being able to do much at all and by the time they reach level 13 and some even sooner being able to jump into the pool and independently swim 5 meters coming up to taking 2 breaths. A few words from Meganne: I always enjoyed my own swimming lessons as a child. So, of course, I jumped at the chance to give my own child that opportunity with Aquatots. Seeing him thoroughly enjoy his lessons, I welcomed the chance to teach - first babies and now toddlers. Watching them learn new skills in a fun, positive way and seeing them grow in confidence to enjoy the water in a safe way is very rewarding and such a joy each week. I am proud of each one of ‘my’ babies as they learn such important life skills! A few words from Melissa: I have always enjoy swimming and learnt from a young age. once I had my first daughter I started to take her swimming, and just like me she throughly enjoyed it. I loved seeing her enjoy the water and get more confident. Thats when I decided to become a swimming teacher. As an Aquatots teacher I love seeing little ones grow confident in the water and progress so much each term. Additional Aquatots Responsibilities: Teacher Development Trainer Responsible for mentoring new trainees in practical pool environment./ Marketing & Social Media Co-Ordinator and member of the Aquatots Development Team. A few words from Natalie: I became an Aquatots Teacher after experiencing Aquatots lessons as a parent, swimming my baby daughter, and having watched my niece come through the Aquatots programme. I have always loved swimming so this seemed like the perfect career change for me after having a child. I have never looked back and struggle to think of another job that would be quite so rewarding and enjoyable on a day to day basis. My husband jokes that I don't work for a living as I just have fun with children in the water, and to be honest sometimes it's easy to agree as how can work be so much fun??? It's so rewarding to think that the skills I am teaching each week are giving children a life skill. My Favourite bits: There are so many enjoyable parts to my role but if I had to pick my favourites I would say being with a Toddler when they take their very first 5 metre independent swim as you actually feel just as proud an emotional as the parents particularly if they have swum with you for some time. My second would be introducing Level 7 babies to the new playtime activity of running on the raft which is always a delight! A few words from Nikki: After having my daughter in 2013, I decided that going back to a full time job with an hour commute there and back wasn't me anymore, and wanted hold out for that perfect work-life balance job. After swimming with Aquatots for several terms I saw they were recruiting, applied and as the saying goes the rest is history! Seeing how well my daughter is doing in the Aquatots programme is such a buzz, and now I can extend that to all my swimmers to! Being in the pool with the small babies right up to the young toddlers is so much fun and so rewarding. Water confidence and safety has always been an important skill I wanted to pass onto my daughter which is why we started at 4 months, and now having the opportunity to do this for many more children is very exciting! My Favourite bits: I love seeing the babies and their parents become more and more confident over the weeks. It is also a great feeling when you start noticing that the babies are understanding the keywords and close their eyes before having a swim underwater. How much they take in so young is always a pleasant (but not an unexpected!) surprise. A few words from Paola: I have always had a passion for swimming. As soon as I found out I was pregnant with my first child I knew that the only thing that I wanted to do with my baby was to take them swimming. I started baby swimming when my son was 14 weeks old. I looked forward to our weekly classes as we both got some much from them as well as lots of one to one bonding time. Everything he has learnt and achieved I have been supporting him every step of the way and being part of all his accomplishments. There are so many proud mummy moments that I will cherish forever!!. When I fell pregnant with my second child I signed us up immediately and started when she too was 14 weeks old. I love that I get to do something so fun with my children but also teach them life saving skills. What could be better?!! Whilst swimming both my children with Aquatots I heard they were recruiting and I jumped at the chance to become a baby swimming teacher. I now get to share my passion of baby swimming with everyone in my class so they can see the wonderful skills and well developed programme their child will be part of and have lots of proud mummy/daddy moments of their own!!! My Favourite bits I have so many favourite bits however, at the top of my list would be watching babies swimming skills develop and grow at every stage and level and then see them swim independently!!! WOW WOW WOW!!! Qualified to Teach : Baby, Toddler, Foundation and Child Levels. A few words from Rita: I dont know why I havent started teaching swimming long time ago. Since swimming my children with Aquatots I thought about it for a long time. Was excited to see that there were opportunities to become a teacher and once done, never looked back. New I would like it cause I love sports but never thought that I would love it this much. My Favourite bits: Fantastic to see how the babies grow in water confidence till they get to toddlers and how much more they grow and enjoy swimming. Taking UW photos is fantastic and also the excitement of the distance swimming is fantastic especially once they reach that first 5m achievement! Additional Aquatots Responsibilities: Teacher Trainer and Development Team member. A few words from Sarah: Becoming an Aquatots Teacher was definitely one of my finer moments!. The swimming programme is fantastic and being part of the team makes me very proud. A few words from Sarah: A grandmother from a level one class once said to me "you have the best job in the world" and I have to agree. It's such a pleasure to share baby's first swims and brand new experiences and developing swimming skills for life. I love developing the relationship with babies and families , seeing the kids , beautiful beaming smiles, teeth growing , voices develop until they start saying ready go and learning your name as their teacher. My favourite bits: Seeing the satisfaction and amazement in the parents face when the babies and children do their first swims , paddle, independent swimming or just gain in confidence whilst having so much fun. Foundation levelsIn particular are especially rewarding to see nervous, unsure kids start to develop skills , happy to splash and gain water Confidence and eventually jump in go under the water and gain distance badges. Think that has to be a personal highlight for me although challenging yet most rewarding . My favourite bits: That look of pride on the parents' face when they see just how much their little one is capable of, watching everyone grow in confidence so quickly and of course that all important high-five and massive smile from the little one's themselves! Currently Teaching at: Oxted, Coulsdon, Brockham and Caterham. A few words from Sharolyn: After our eldest started with swimming with Aquatots, I began thinking about teaching. Then when our 2nd came along, it just made sense. Why not teach other Mum's and Dad's to enjoy the water with their babies, while teaching them a life skill. As a family we all love our Aquatots lessons, and I now take great joy in being able to share that with other families. My Favourite bits: Watching the children progress through the levels is so rewarding. Taking them from their first underwater swim in Level 1, to having the confidence to be able to run along the raft and jump in in Level 7 is just amazing! And taking underwater photos has to be one of my favourite weeks of the term. They are such a special momento of your baby's childhood. My favourite bits: I love seeing the baby's grow in abilities and parents making friends but seeing the little smiles when the baby's see the pool and splashing learning an invaluable life skill is amazing. A few words from Sophie: I always liked swimming and diving. My partner and I decided that it would be good for our son to learn to swim early so while on maternity leave, I signed up my 10 weeks old son to Aquatots and he just loves it! When I saw that Aquatots was recruiting more baby teachers, I signed up because I really enjoyed our swim classes and it would be nice to give a similar experience to other parents. I am an ecologist during the week so I can only teach during the weekend. My favourite bits: My favorite baby swimming skill is piggyback and I think the most rewarding part of this job is when you get parents and/or baby who overcome their worries about swimming, start to enjoy their lessons and ask for more. A few words from Susie: After a long career in the city, and working full time after my 1st child, I started thinking about alternative career options – swimming has always been important to me, so lessons were a must for my 2 boys. Choosing Aquatots lessons for my own children turned on that ‘light bulb’ moment – I wanted to become a teacher! And I’m so happy I did! It’s so much more than just swimming lessons. It’s a complete swimming, life-saving programme, that builds confidence and above all, is so much fun! My Favourite bits: There are so many! Seeing those level 1 babies at the end of their first term, prepare for underwater swims by closing their eyes & mouths is truly amazing! And the smiles from children when they have just swum 5 meters independently – it is so special. I feel so privileged to be a part of those moments. Background: After leaving school, college and eventually university to study Business Management. I enjoy travelling and help to run a local non-league football club. Previous professions: worked for 8 years in Scuba Diving as a retail assistant and sales executive. Family: No children at the moment, but sure to change once married next year! Any special water interests: Very keen scuba diver and strong swimmer. What you think is the most rewarding part of my job: Being part of a team where we can help so many children to safely enjoy the water and learn to swim. What you like the most about Aquatots: Working in an environment where we can all learn and grow together, enjoying our work and having fun. Background: A proud mum of my two grown children, and a lover of my cat and dog. Previous professions: I've worked at a social club as the secretary as well as a primary school after school club co-ordinator. Family: I have one daughter and one son, both now grown up. What you think is the most rewarding part of my job: I enjoy speaking to new swimmers parents and hearing just how well their baby is doing in their classes. What you like the most about Aquatots: I like to catch up with all the teachers and enjoy working in a small friendly office.